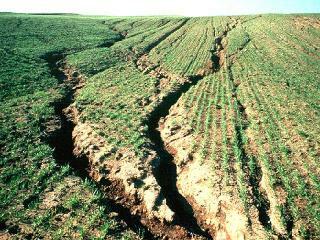 Soil erosion by water (aka 'water erosion') is the result of rain detaching and transporting vulnerable soil, either directly by means of rainsplash or indirectly by rill and gully erosion. Rain may move soil directly: this is known as 'rainsplash erosion' (or just 'splash erosion'). Spash is only effective if the rain falls with sufficient intensity. If it does, then as the raindrops hit bare soil, their kinetic energy is able to detach and move soil particles a short distance. Because soil particles can only be moved a few centimetres (at most) by this process, its effects are solely on-site. Although considerable quantities of soil may be moved by rainsplash, it is all merely redistributed back over the surface of the soil (on steep slopes, however, there will be a modest net downslope movement of splashed soil). Thus a more descriptive term might be 'rainsplash redistribution'. Because rainsplash requires high rainfall intensities, it is most effective under convective rainstorms in the world's equatorial regions. Rainsplash is relatively ineffective where rain falls with a low intensity (e.g. because the rainfall is of frontal origin), such as in the north-west of the USA or in northern Europe. Rainfall may also move soil indirectly, by means of runoff in rills (small channels) or gullies (larger channels, too big to be removed by tillage). 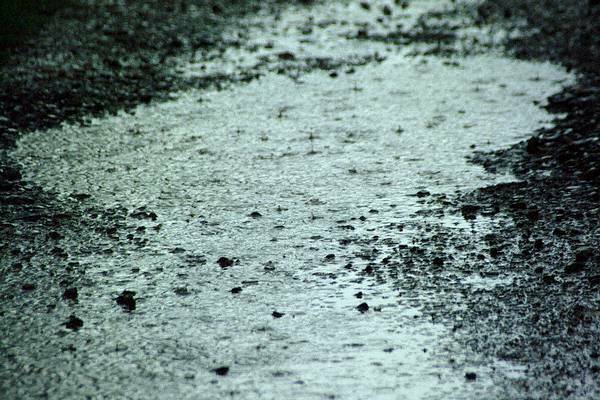 In many parts of the world, rill and gully erosion is the dominant form of water erosion. That fraction of the rainfall which does not infiltrate (soak into) the soil will flow downhill under the action of gravity; it is then known as runoff or overland flow. Runoff may occur for two reasons. Firstly, if rain arrives too quickly (i.e. with too high an intensity) for it to infiltrate: the runoff which results is then known as infiltration excess runoff, or Hortonian runoff. 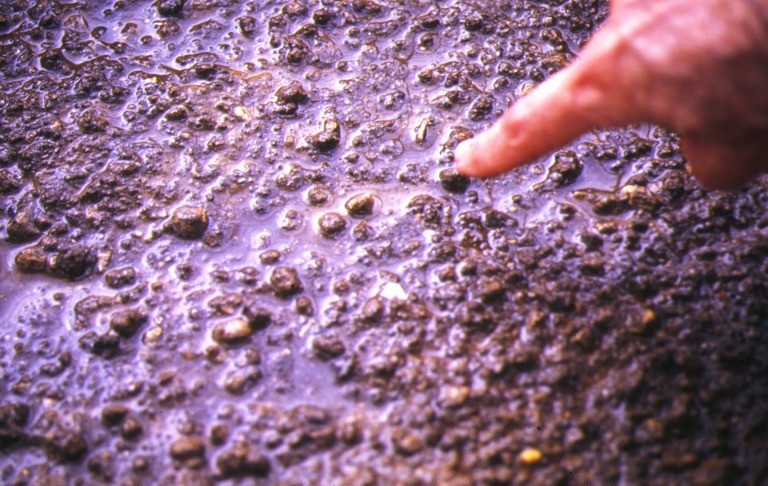 Secondly, runoff may occur if the soil has already absorbed all the water it can hold (i.e. because it is fully saturated, or if the soil is frozen). Runoff which results from this situation is known as saturation excess runoff. 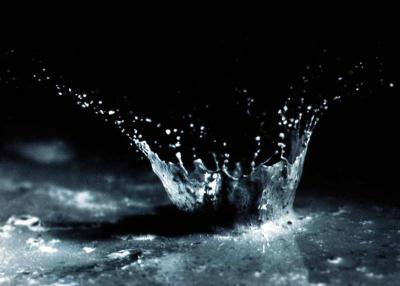 As runoff moves downhill, it is at first a thin diffuse film of water which has lost virtually all the kinetic energy which it possessed as falling rain. Thus it moves only slowly, has a low flow power, and is generally incapable of detaching or transporting soil particles. The microtopography (i.e. 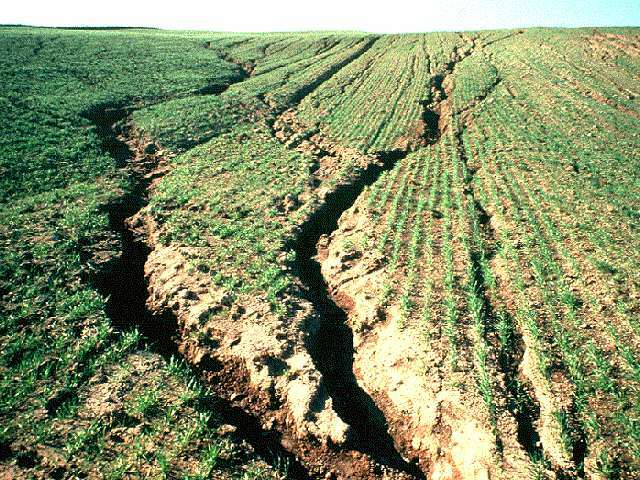 small-scale pattern of irregularities) of the soils surface tends to cause this overland flow to concentrate in closed depressions, which slowly fill: this is known as detention storage or ponding. 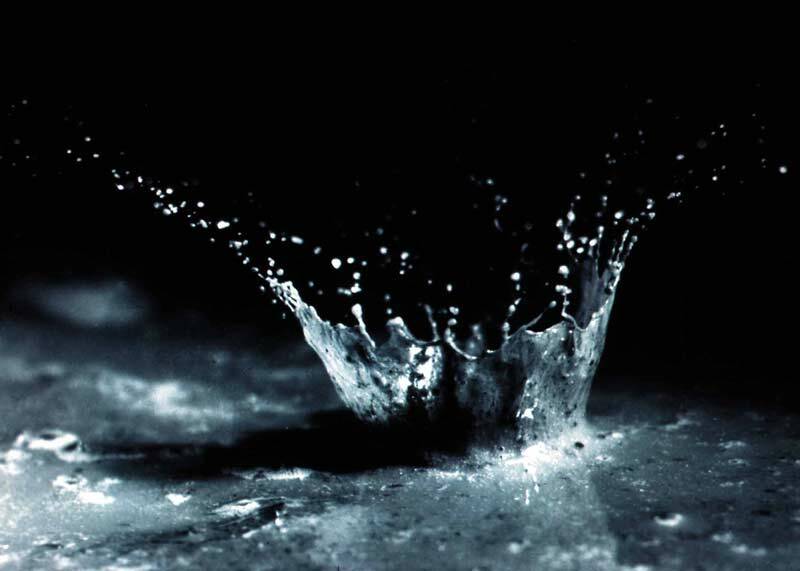 Both the flowing water, and the water in detention storage, protect the soil from raindrop impact, so that rainsplash redistribution usually decreases over time within a storm, as the depth of surface water increases. There are, however, complex interactions between rainsplash and overland flow. If rain continues, the increasing depth of water will eventually overtop the microtopographic depressions. Overland flow that is released in this way is likely to flow downhill more quickly and in greater quantities (i.e. possess more flow power as a result of its kinetic energy), and so may be able to begin transporting and even detaching soil particles. Where it does so, the soils surface will be lowered slightly. Lowered areas form preferential flow paths for subsequent flow, and these flow paths are in turn eroded further. Eventually, this positive feedback cycle results in small, well-defined linear concentrations of overland flow (microrills or traces). In many cases, individual microrills become ineffective over time due to sedimentation. A subset, however, grow further to become rills; and a smaller subset may go on to develop into gullies. This process of competition between microrills and rills leads to the self-organized formation of networks of erosional channels (dendritic on natural soil surfaces; constrained by the direction of tillage on agricultural soils), which form efficient pathways for the removal of water from hillslopes. It is in such erosional channels that water erosion also operates most effectively to detach and remove soil by its kinetic energy. In most situations erosion by concentrated flow is the main agent of erosion by water. The flow-dominated erosional channels are separated by interrill areas where the dominant processes are rainsplash and diffuse overland flow; however, boundaries between rill and interrill areas are both ill-defined and constantly shifting. In some circumstances subsurface flow may be important in determining where channel erosion will begin and develop (e.g. at the base of slopes, and in areas of very deep soils such as tropical saprolites). Meltwater from thawing snow operates in a broadly similar way to rain-derived overland flow, detaching and transporting unfrozen soil in areas of concentrated flow. Snowmelt erosion is, though, less well studied and less well understood. As erosional channels increase in size (i.e. grow to become large rills and gullies), processes such as gravitational collapse of channel walls and heads increase in importance. Runoff and sediment from rills and gullies may be moved into ditches, stream and rivers, and so transported well away from the point of origin. 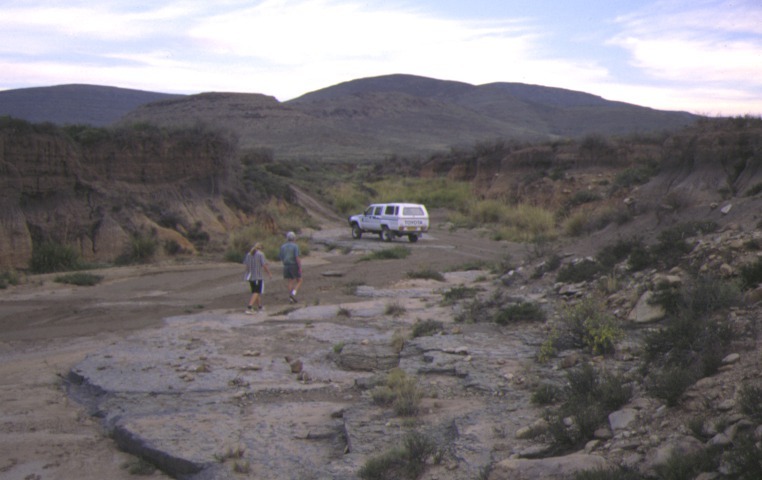 However, sediment may also be deposited within the rill or gully, or beyond the rill or gullys confines in a depositional fan, at locations where the gradient slackens. Here it may be stored for a variable period of time, possibly being reworked by tillage activity, until a subsequent erosion event is of sufficient size to re-erode the stored sediment. It may then be redeposited further downstream, or make its way into a permanent watercourse and thence to lake or ocean.